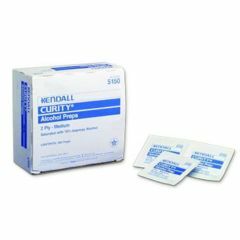 Customers buy these products with the Monoject Softpack Insulin Syringe - 1ml (100 Units) 28g x 1/2"
Monoject Softpack Insulin Syringe - 1ml (100 Units) 28g x 1/2"
Curity Alcohol Prep Pads are ideal for cleansing and disinfecting. Each lightweight, medium 2-ply poly-lined pouch is saturated with 70% Isopropyl alcohol. 1" x 1 1/4" folded. when there is no others. where is the alcohol? why arey they so small? Lightweight. Portable. Safe. Easy to Use. Easy Storage. At home. On the go. Great Person!. Medical Professional. Average Health. Lightweight. Economical. Portable. Safe. Easy to Use. Easy Storage. Durable. Sturdy. On the go. At home. Emergency care. Chronic care. Elderly. Emergency. Elderly care. I use these when I am flushing my husband's picc line. At home. Emergency care. Chronic care. Pediatric care. Medical facility. Elderly. Following Surgery. Emergency. Elderly care. Elderly. Disabled. Great Person!. Positive person. Chronic illness patient. I have been wanting to buy prep pads for quite a while as I have very dry skin and bandaids don't seem to want to stick to me. I found some in other places, but they were way too expensive! I couldn't believe the price. So I bought a box to try them and they work super! I would highly recommend these prep pads! by Redhead1949 from Leominster, MA. Easy to Use. Durable. Economical. On the go. At home. Emergency care. Chronic care. Pediatric care. Medical facility. Elderly. Following Surgery. Emergency. Elderly care. How much alcohol is on each prep pad? It says 70% on the box. I'm not sure you can measure it, but the pads are well saturated. I hope that helps. There is not a great deal of alcohol on the preps. They are, however, sufficient for wiping/sterilizing inject-able medicine vials and skin areas where the injection is to take place. no but they will dry out faster if not kept in a plastic bag. Answered on May 5, 2013 9:32:29 PM by bonniek from ft.smith ar. I have carried them for weeks in my purse and hey were fine. Where is the alcohol prep pads made at? I don't want MADE IN CHINA! Answered on Dec 22, 2012 1:15:25 AM by Lenny from San Diego Ca. Asked on Jul 31, 2011 2:12:05 PM by Mar from Wis.
A good rule of thumb for small units of this type from my experience is one year if stored in a cool area out of direct sunlight. Storage conditions can shorten the shelf life if exposed to high temperatures, which will cause the product to dry up. Cool dry storage away from sunlight provides maximum shelf life for "dry storage items" in general.